-Ear wize like will we need to do anything with them? -are they generaly fine in cars or dose it depend on the dog? 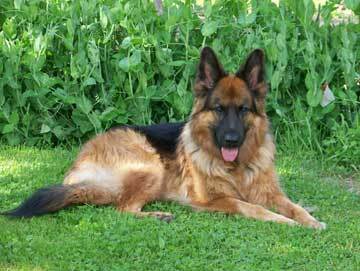 -Is a mix breed of a german shepherd bad? -what is minimum yard size for them? - Ears - will we need to do anything with them? A. Probably not but you will never know for sure because it is all up to the individual GSD puppy's developing system based on many factors like heredity, nutrition, care, etc. But even if they do need some extra help there are things you can do to help the ears come on up in most, but not all, cases. A. All dogs nails have to be trimmed from time to time unless they are constantly working on a hardscape like asphalt, etc. And even then, a trim is still needed from time to time. Remember, their nails grow all the time just like a persons and do need to be clipped to keep the dog healthy. A. There are so many different dog food brands available today that it is very important to read the bags to see what is included in the food. In many cases you'll be surprised at what is in, or not, the food. My advice is to buy the best food you can afford from bag to bag and to stay consistent. And if there is a pet food store near you the workers are very helpful in answering questions and sometimes they even offer free samples from time to time. - what about cars riding? - german shepherd mix breed? A. GSDs can do well with a smaller yard or even in an apartment but it's very important that it be fenced in or that you keep your dog on a leash while outside because it only takes a second for a dog to loose and get hit by a car. But keep in mind that they are an active breed and do need some exercise - both mental and physical. A. Most dogs love balls but other kinds of toys include kongs, jolly balls and tough dog toys. And you will need to train your puppy and you can start in an early puppy class too and should keep the training going from then on to keep your super smart GSD happy. So, I hope these answers help you in your German Shepherd puppy research. Good luck.